Vitamins – organic or synthetic? | Blog about health and medicine Vitamins – organic or synthetic? Vitamins are organic compounds which are not synthesized inside an organism though necessary for its normal life activity, food being primarily the vitamins main source. Without hesitation we take in a great amount of synthetic vitamin preparations and hardly ever can imagine the result of it. We believe vitamins be always useful and the more of them the better. This may be dangerous. The hypervitaminosis caused by the artificial vitamins is as harmful for the organism as the hypovitaminosis. 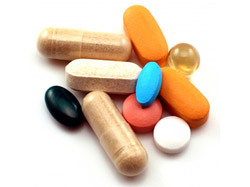 Even the low amounts of synthetic vitamins may cause gastrointestinal disease, allergies, urolithiasis etc. The natural vitamin is an integral biological complex. It has a special structure and is connected with other substances. On the other hand the qualities of the artificial crystalloid vitamin are quite different. The artificial vitamin is a crystalloid which can become active only when it takes the natural vitamin space structure and provided it is connected with other substances which are part of the natural vitamin. As a rule only a small part of the synthetic vitamin takes the natural structure of the organic vitamin, while “remnants” go about the body for long time to deposit at last on the walls of blood vessels, which cause damage of the latter. Synthetic vitamins are cheap. The natural ones are extracted out of plant material. In order to get only 1 g of biologically active substance one must have processed over 10 kg of first-rate plant mass. Hence the vitamins thus obtained cannot but cost. Of course they too are much more effective for health as compared with “vitamin-like” substances. The biological significance of vitamins is of great might. In practice every organ or tissue needs vitamins, therefore they are indispensable nutrition factor. At the cellular level they take part in building and functioning of biomembrane. Every vitamin in our organism is of its own biological value. If an allowable concentration level of vitamin in the organism exceeds the vitamin may change its friendly role on enemy one. This is especially right as to the synthetic vitamins – substances alien to the organism. The natural vitamins surplus however carries no side effects. Even in summer and autumn the vitamins contained in fresh products cannot fully provide the organism’s needs. It has long been known that the best treatment is prevention. It is easy to control a disease caused by a lack of some substances in nutrition – one should simply add them. There are special mixtures – food additives which are able to keep the organism healthy unless rightly used. The biological advantage of vitamins depends on their origin. The chemically derived vitamin is mostly “lifeless”. The vitamin of a natural origin that can be found in food is living. These are living vitamins whose task is to strengthen and protect our organism. Hello There. I discovered your weblog the use of msn. This is a very well written article. I’ll make sure to bookmark it and return to read more of your helpful info. Thanks for the post. I’ll definitely comeback.